Self-taught in everything, including the military art, Forrest was commander of great skill and daring, considered by William T. Sherman the most dangerous man in the Confederacy. His philosophy of combat was simple: “Get there first with the most men” (often misquoted as “Get there firstest with the mostest”). 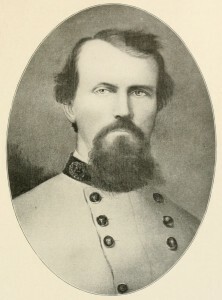 His reputation for ruthlessness was certified by his role in the Ft. Pillow Massacre (April 12, 1864), in which more than 300 African-American troops were slaughtered after they surrendered. Following the war, Forrest organized the original Ku Klux Klan, serving for a time as its Grand Wizard.